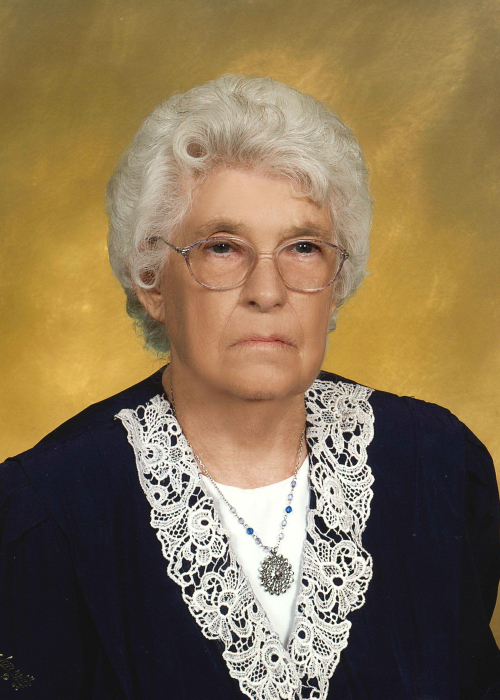 Dollie Huskins Wilson, age 96, of Busick, went home to be with the Lord on Friday, February 8th, 2019 at the Brian Center in Spruce Pine surrounded by her loving family. A native of Yancey County, she was a daughter of the late Mart and Dora Young Huskins. Dollie was the wife of the late Walter Wilson, who passed away in 1971. She was also preceded in death by a son-in-law, Steve Brewer and brothers: Homer, Jack, Claude and infant brother, Clayton Huskins. Dollie was the oldest living member of Mt. Mitchell Baptist Church and loved sewing, cooking, quilting and her flowers. She will always be remembered as a loving mother and grandmother. Left to cherish her memories is her children: Donald Wilson and wife, Myril, of Busick, Carolyn Brewer of Marion, Doris Huskins and husband, Ricky, of Busick, and Judy Chrisawn and husband, Claude, of Busick; sisters: Maude Murphy of Busick and Jewell Frye and husband, Ike, of Seven Mile Ridge; six grandchildren: Allen Wilson and wife, Sandy, Benita Suttle and husband, Larry, Scott Wilson and wife, Karen, Charlene Wilson, Angie McGee and husband, Allen, and Stacy Whitson; fourteen great-grandchildren and seven great, great-grandchildren. Numerous nieces, nephews and other extended family members also survive. The family will receive friends from 5 until 7 p.m. on Tuesday, February 12th in the Chapel of Yancey Funeral Services. Funeral Services will follow at 7 p.m. with Rev. Forest Westall and Ricky Huskins officiating. Graveside Services will be held at 11 a.m. on Wednesday in the Fairview Baptist Church Cemetery on Seven Mile Ridge. The family would like to say a special thank you to the Brian Center and Hospice and Palliative Care of the Blue Ridge for the wonderful care given to Dollie and requests memorials be made to Hospice at 236 Hospital Drive, Spruce Pine, NC 28777.